Even if you’ve never tried it before, why not come down to the Maison de la Pêche in Arques – who knows, you might get hooked! It’s a great way to enjoy the great outdoors. There’s nothing more natural than fishing in the Pas-de-Calais! With its innumerable lakes and marshes, connected by canals, there is no shortage of playgrounds for the experienced or amateur angler. And to increase the area’s appeal, in the last few years three « fishing-friendly » accommodation options have become available. In the Pas-de-Calais, serious fishing enthusiasts come to lure sea trout and Atlantic salmon. You’ll also find lovers of fly fishing come from further afield (especially our Dutch, Belgian and English friends). 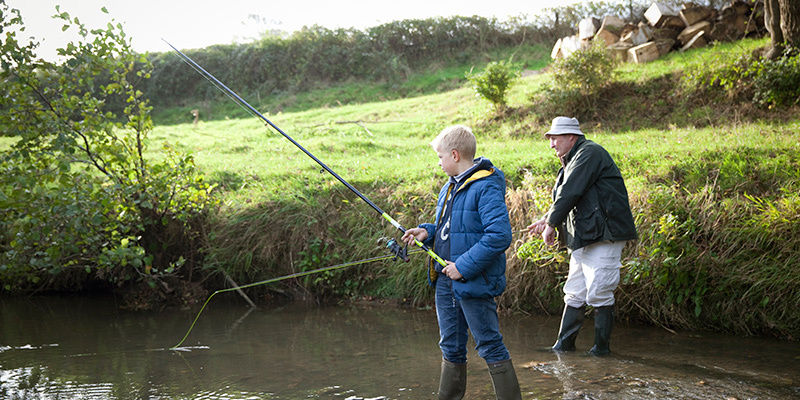 Families will love to go bait fishing for trout, or coarse angling, all easily accessible on the lakes. Without a doubt, we love fishing in the Pas-de-Calais, this land of countless rivers, canals and ponds. With fishing, the pleasure comes from the waiting, the natural surroundings and the fine catches taken home the same evening. To contribute to the preservation of resources, the Carte de Pêche must first be purchased on the internet for 13 euros. Don’t forget!